ChefShop.com/enews - "12 Festive Wrappings - 12 flavors and much more from chefshop.com"
They say that the mother has the biggest influence on her children’s personality and sophistication. Proof may be in the proofing, when it comes to Panettone. Unlike many of the grocery store brands you see at bargain-basement pricing, the only similarity is in the name. Without the sophistication and cultivation that comes from a Mother yeast that has been kept alive for over 80 years, or a family recipe that has been kept a secret since the 18th century, or a baking process that takes over 48 hours, it is not a true handmade Italian Panettone. 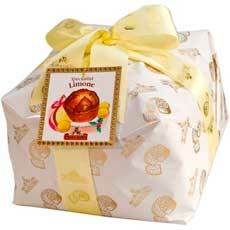 It’s a process that can’t be rushed and it’s why Panettone is so mouth-watering and worth the wait. Studded with chunks of local apricots, whose slight tartness is the perfect complement to the rich sweet bread surrounding them. 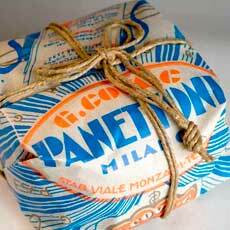 Like all the wondrous panettone from Albertengo, this one is light and buttery, has a soft texture that will melt in your mouth. 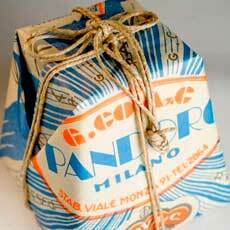 This is G.Cova's classic fruit panettone delightfully hand wrapped with their vintage blue wrap and tied with twine. 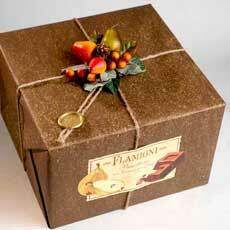 Studded with bits of dark chocolate instead of the traditional raisins and candied fruits. Add to that a Piedmont hazelnut icing - and you have a winner and a half! 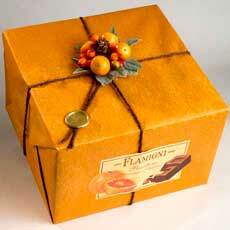 Orange and Chocolato in the mixture gives to this Panettone an inimitable taste. A wonderful taste of rich, naturally candied orange pieces, drops of pure plain chocolate, and Piedmont Hazelnut icing. Grand Chocolate! 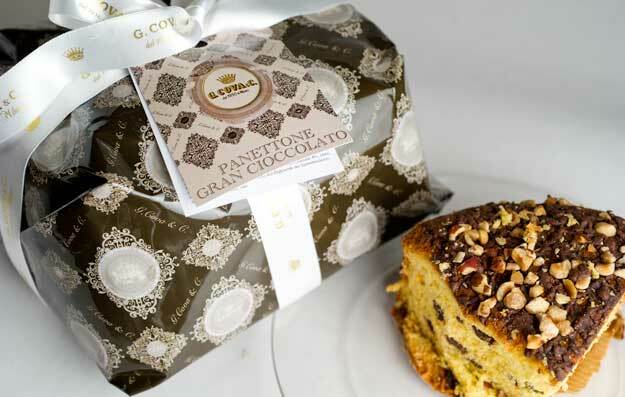 If you like chocolate with your panettone, then this is a cake not to be missed. 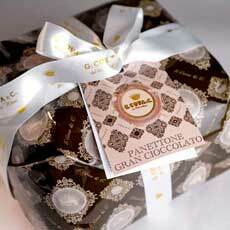 This is G.Cova's chocolate panettone made only with bits of quality dark chocolate and nothing else. Topped with a chocolate glaze and bits of hazelnut - you cannot believe how good it is! Luscious Italian Christmas bread, studded with bits of chocolate and fig - without raisins or citrus fruit. Chocolate and Fig, an amazing combination - and definitely worth trying. 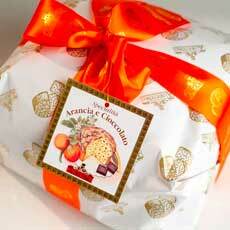 The combination of pear and chocolate added to a Panettone is a pleaser, no matter what your preference is. 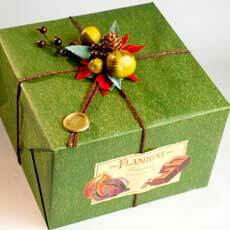 This beautifully topped box with fruit makes for a special gift to anyone, including yourself! The steps to success to make a panettone: Mix and combine flour, your mother's yeast, egg, butter, cane sugar, and then to spend the night together (leavening). Mixing in fruit or additional ingredients also happens before nightfall. The dough is then divided and rolled into a large ball. The "bolo" is then taken to a warm, humid room called the leavening chamber. The frosting is then applied (or not), typically this might include hazelnuts, almonds, chocolate, or sugar, along with egg white. Then, into the oven for baking for around sixty minutes, depending on the size. 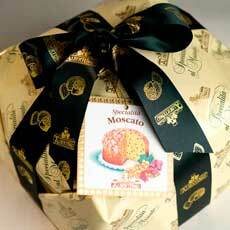 For instance, an 8.8 pound panettone can take 4 hours! 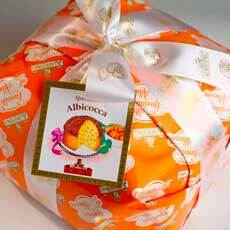 After baking, the cooling process takes 12 or more hours with the panettone hanging upside down. 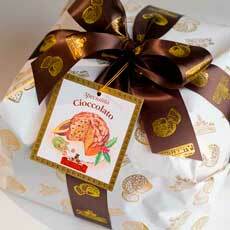 The panettone are then hand wrapped in their signature holiday attire. 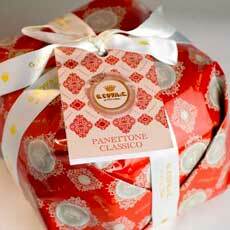 shop for real, handmade, artisan Panettone. The French are coming! Well not exactly. 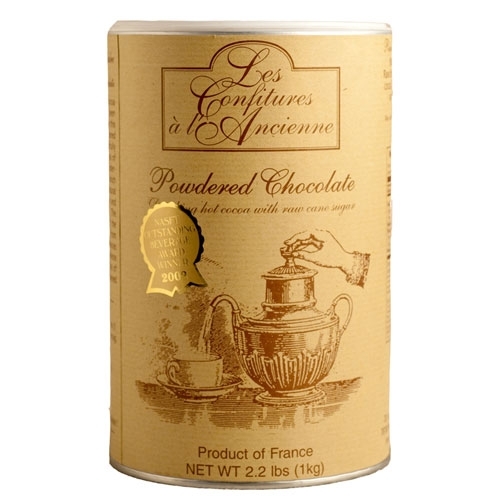 More like our order for your favorites, like L'Ancienne Hot Chocolate, Mademoiselle de Margaux, and a bunch of new treats. Do your remember chicory? Well it's back! Like coffee in flavor and look, it is a good substitute if you don't want the caffeine. We can't wait! The new oils are shipping! Olio Nuovo is coming. Shipping by land and by air we expect to see it all by mid December. We'll announce it in the Newsletter when they arrive so keep your eyes peeled! Look for the party announcement at the shop to celebrate. It's time to place your order for the best smoked ham! Wine Spectator loved it and we do too. This is a smoked-to-order ham. Limited supply. There are many styles or types of macaroons. The origins are like this recipe. Almond paste, sugar and egg whites. Getting the mix right is both hard and easy. It's just a matter of mixing the egg whites in so you can make the almond paste easy enough to work with. Chocolate Bark with Almonds, candied fruit and Trapani Sea salt. This is a classic brown sauce made with light and lightly acidic Verjus. Thierry pairs this sauce with the ever-rich foie gras. It's the holidays, make sure you make your reservations at Rovers, or your local excellent restaurant, might be one of the best ways to celebrate the year past!